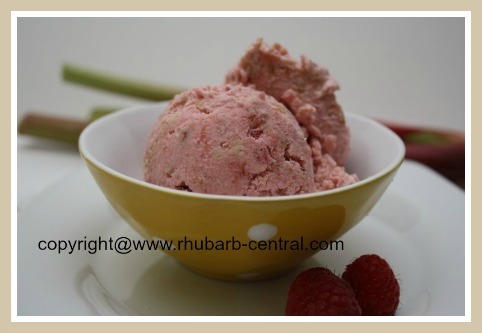 This Homemade Rhubarb Raspberry Ice Cream Recipe includes delectable rhubarb, raspberries and cookie crumble to give it amazing flavour, colour and texture! 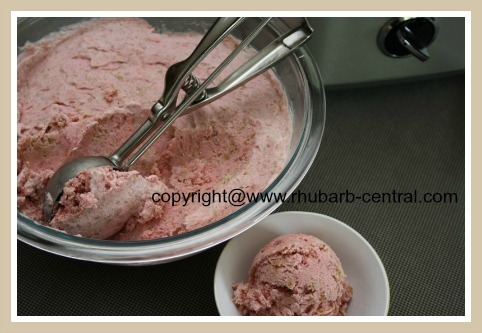 You will be sure to get requests for a second serving with this ice cream recipe! 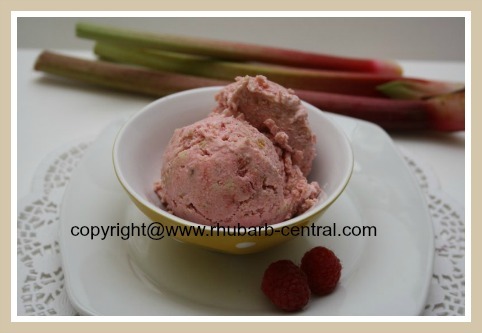 Rhubarb Ice Cream is SOO Yummy! You can use fresh OR frozen red or black raspberries for this recipe. 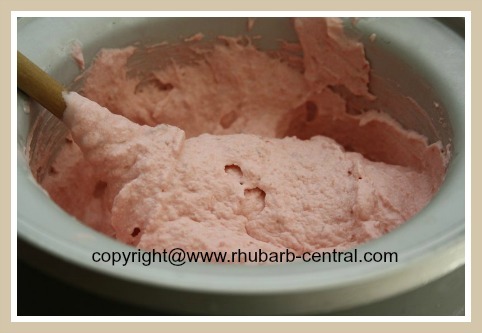 I like to make the rhubarb puree a couple of days before making the ice cream recipe to ensure that it has cooled well. Note: If you are using frozen raspberries, do not thaw them first. 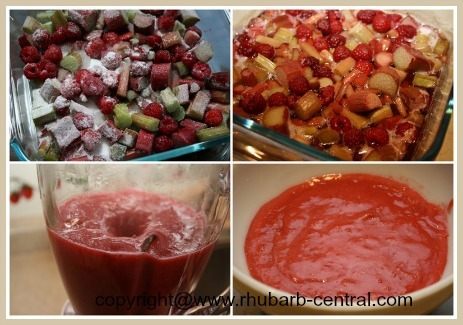 In a large baking dish combine the chopped rhubarb, raspberries, sugar and the lemon. Place dish in oven and bake for about 20 minutes at 375° F.
Cool, and, using a food processor, or a blender, blend until mixture is smooth (see images below). It's SO EASY to Make Homemade Ice Cream! In a bowl, combine the brown sugar and the butter and mix well, using a fork. Add the flour, and continue to mix. 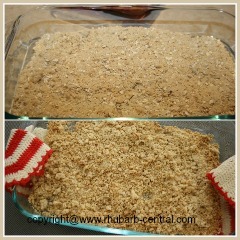 Add the rolled oats and the ginger, and continue to mix till well combined, and the mixture resembles coarse crumbs. Transfer the crumble mixture to a baking dish and place in the oven at 375° F for about 10 minutes, or until golden. Remove from the oven, and break crumble mixture into small pieces. 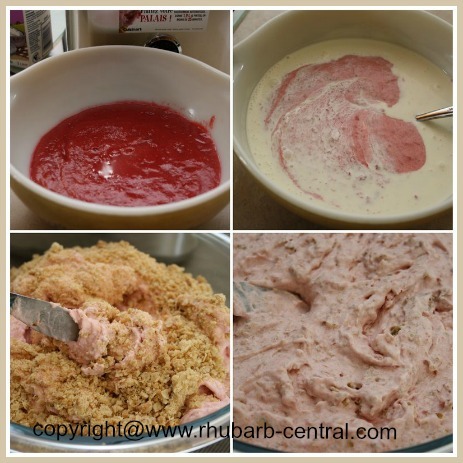 In another, large, bowl combine the heavy cream and the cooled rhubarb/raspberry puree. 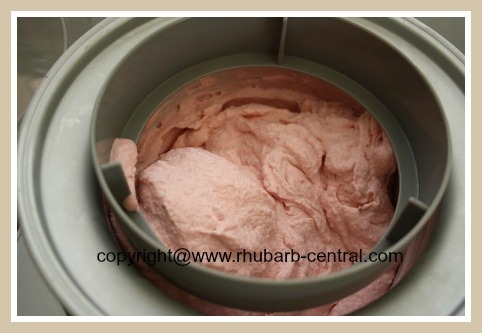 Churn mixture in a ice cream maker machine, according to the manufacturer's instructions (about 25 minutes). Spoon the ice cream and crumble pieces into a freezer-safe container in alternate layers. Then, using a metal spatula or a blunt knife, gently cut through the layers, swirling the cookie crumble throughout the ice cream. Immediately cover the surface of the ice cream with waxed paper or foil, and freeze for at least 3 - 4 hours. 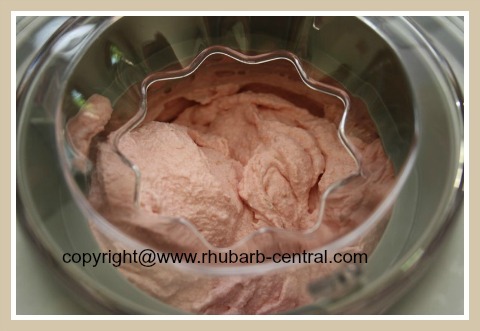 Makes about 1 litre of yummy rhubarb ice cream! Making homemade ice cream is really very simple using an Ice Cream Maker! I never knew it was so simple! For an extra special treat make some homemade raspberry sauce for the perfect topping for ice cream, cakes, puddings and more! 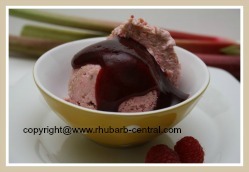 Or add a topping of purchased raspberry or other berry sauce! Although using an Ice Cream Maker Machine may make making homemade ice cream somewhat easier, you can easily make your own ice cream without a machine. If you are interested in purchasing an Ice Cream Maker, here (below) are ideas of what is available to purchase online at *Amazon.com. 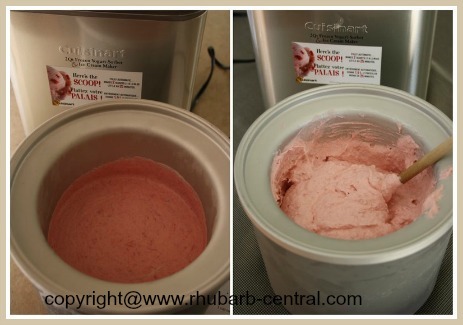 (The second ice-cream maker below, the "CUISINART" is the model I use and I LOVE IT!). Below are links to various books for recipes of homemade ice cream. If you prefer vegan ice cream recipes, the last book item below contains vegan ice cream recipes. Click on the images for additional product information and customer reviews of the recipe books, available for online purchase at *Amazon.com.